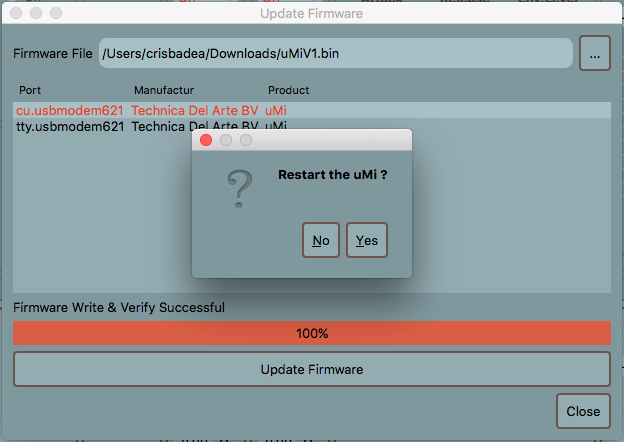 Start uMi Control to update the Firmware. Make sure the uMi is not active or in use by any application, then navigate to the tab menu “Tools/Update Firmware”. After pressing the uMi button for about 3 seconds, you will be prompted to install the uMi serial Communication driver for Windows. The driver file is located in the installer directory of the uMi Control application. NOTE: In macOS and Windows 10 this is not needed, but in macOS you will see the device listed twice; once as CU and secondly as tty. Please select CU. The latest firmware file can be chosen via the navigation button. After the update, you will be prompted to restart the uMi, so it will restart as an audio device.